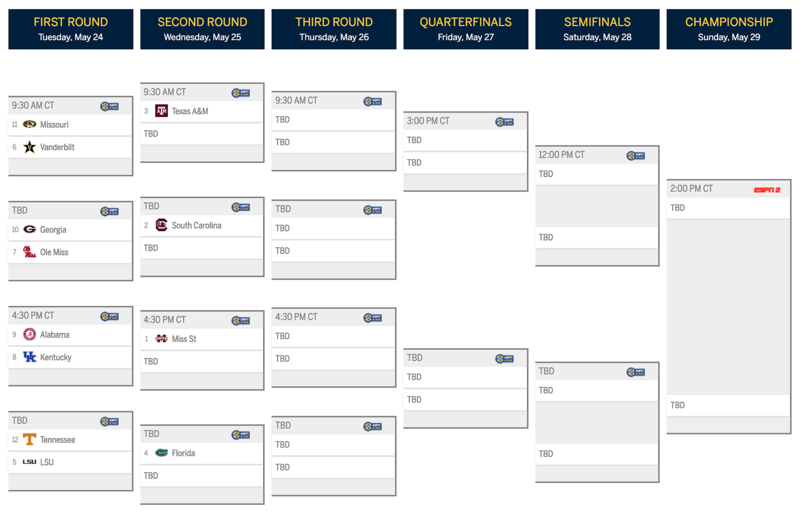 The 2016 SEC Tournament field is set and Alabama will open against Kentucky on Tuesday afternoon. The Crimson Tide finished as the 9-seed after losing all three games of its final home series of the season against South Carolina this weekend. Alabama's 15-15 conference record led to a 5th-place finish in the SEC West. The team will open against the Wildcats, which earned the 8-seed after finishing with an identical SEC record as the Tide. Kentucky earned the higher seed after beating Alabama two out of three games in Lexington. The winner of Tuesday's game will face the regular season champion Mississippi State, which grabbed the top seed after winning 10 straight games to finish the season. The Bulldogs last loss came at Alabama in April. Here's a look at the full bracket with times and television.